There are many urban legends about slots that people will like to believe are true. Some players will also like to believe that their lucky charm brings them luck and will always let them win. The sobering truth about slots is that they only pay out when they are supposed to. There is no secret formula to making these machines pay out all their coins to you. A slot machine is a programmed game that is basically a computer with software that dictates when it pay outs. These wins are generated by a RNG (Random Number Generator) which randomly decides when a player wins. These programs are sophisticated and created by professionals that can’t even tell when a slot will pay out. Here are some of the most told urban legends about online slots and live slots. 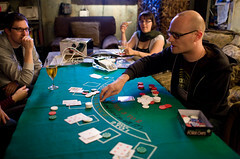 Many people believe that the location of a slot in the casino will determine if it is sure to be a winner. Some feel that the ones right at the front will never win as they are put there to “trick” the players into using bad slots. They will run around in circles looking for ones that haven’t been played or are in obscure locations. This is a waste of effort and you can look quite silly running around like a chicken with its head cut off. Regardless of where the slot is, it will be programmed just like the rest. If a slot machine does happen to be paying off because it’s in the back where no one will ever play it, this is just your lucky day and the RNG has been hit. There is no connection between its location and pay outs that should ever be used to determine what slot you play. One of the funniest and sometimes awkward moments in a casino is when you see a player stalk over another player like a vulture waiting for them to die. They feel that the person playing now will juice up the machine and once they leave, it will be their turn to win. They jump in the seat as soon as this person gets up as if it was the last chair on earth and start pumping the machines with coins. Not only is this totally false, it is also quite rude. Again, the machine will not be juiced up and hit once you sit down. It will hit at a random time that no one can ever predict. Some players believe that when they hit the buttons or click the buttons online a certain way it will trigger the slot to pay out. This is one of the more comical urban legends and can be considered to be borderline obsessive compulsive. A slot machine is not a safe that can be cracked by entering a code. The way you hit the buttons will never determine when it hits a payout. You may feel better about doing this as it will likely fulfill your OCD needs, but that’s about as far as this method will go. These are just a few urban legends about slot machines, but there are many more. The bottom line is that a slot machine will only pay out when it is supposed to according to its software. There is nothing you can do to make it win while you are playing it. Share with us some of your favorite myths about slot machines. If you feel some are true, we’d like to hear about it. Are you a new slots games player? Not sure you are getting the right grip of the game? It is a well known fact that casino games tend to have their own slang and terminology, it is always important to get familiar with them in order to play the game wisely. Slots have their very own terms as well, and as a player it is imperative that you know it by heart. We have created a small list of the most common online slots terminology to help you understand the game a little better. Coin size: This does not refer to the size of the coin as well; you don’t really use coins to play online slots. This is referring to the amount you want to bet per line on your game. Credit meter: This is a little screen that tells you how much credit you have to play with. It is more often seen on land based slot machines; however it is also used on the online slot versions in some cases. First deposit bonus: If you are playing at an online casino for the first time, they will provide you with a sign up bonus which increases the amount of money you will be playing with. Max Bet: The maximum bet you are allowed to play on each spin. Onesies: Players that who bet only one coin per spin. Pay-line: These are the directions or ways in which the symbols can be lined up in order to get a winning combination. These can be tricky on online slot machines that have many paylines; it is recommended that you check how are the pay lines on each game you play for the first time before hand. Payout: When you are playing at any slot machine, winnings pay out in relation to the amount of money that is put in, stated as a percentage (payout percentage). Progressive Jackpot: The top jackpot that grows progressively as more players bet on the game. This is something very interesting: Slot machines are often linked together among several online casinos which mean more players put in more money in and create all together a much larger combined jackpot. Static Jackpot: A jackpot that is pre-determined and doesn’t change. Scatter Symbol: These are symbols specifically related to a game. How they work I when two or more of them appear anywhere on your reels, which means a bonus game is activated or features free spins. Wild Symbol: This is a term was stolen from Poker: as you probably know, in Poker certain cards in the deck can substitute any other card make a winning combination, it works the same in online slots. The Wild Symbol can substitute for any other symbol (except for Scatter symbols) and help you win. Pay outs at Online Casino: how do they work? Have you ever tried to play at an online casino? If not, you probably have lots of questions before actually trying it out. Perhaps you would like to try online casino poker tournaments but are not really sure on how they work, how do you join, but most importantly: how do you cash out if you win? To be able to withdraw money, the first step is to log into your casino account and clicking on the cashier button, this will take you into your main screen, look for the WITHDRAW MONEY button and click on it. There are several withdrawal methods that will immediately display, in our case we offer: Click2pay, MG Cash, Neteller, Overnight Express (Check), UsemyWallet, Wire Transfer or WU Cash. It is important to keep in mind that most cash out methods will charge you a fee for their service. If you are not familiar with these fees, you can contact the Customer Service Department at The Virtual Casino and they will give you all the pertinent information. After you have requested your pay out and have chosen a payment method, the request is submitted to the Withdrawals Department where your personal information will be checked out to make sure no one is trying to use your account in a fraudulent way, also, there are different rules regarding withdrawals: if for example you used a bonus, a free chip or a coupon code, they all have different cash out rules, which will be verified by the Withdrawals agents. If the withdrawal request does not meet the requirements, it will be denied within 72 hours after the request has been made. In the case that the withdrawal does meet all cash out requirements, the approval takes within 10-15 business days of the date the withdrawal was requested. The reason why this takes so long is mostly because all the personal information needs to be verified in detail. After you request is approved, you will receive notification within 48 hours of the approval. At this moment you are required to verify all personal information one last time and will be given the choices of current payout options. For each type of withdrawal request, there is certain documentation involved and the player need to comply with all of it in order for the withdrawal will be processed. Another important thing to remember is that there are weekly cash out limits, in the case of The Virtual Casino, we have a max cash-out of $2,000.00 per week, however depending on your player status these can be higher, for example if you are a VIP player. When will I finally get my money? In most cases, payments are made within 7 –10 business days of approval; yet this is not an exact estimate as you can see and there is the possibility of a slight delay every once in a while, these mostly because of the banking issues currently undergoing gambling activities. Depending on the payment method you chose, the payment dates may also vary. So now that you have a clearer idea on how do casino pay outs work, and have a better sense of the security methods used to make sure you receive your money, you might feel a bit less hesitant about doing a deposit to play, don’t you? Posted in Casino Articles, Casino Tips | Comments Off on Pay outs at Online Casino: how do they work? For the past 4 years, ever since a prominent UK Gaming CEO was arrested in the US, the law concerning internet gaming in both the US and Canada has been in a state of flux. Due to a gaming “clause” snuck into a security Port bill by Bush’s Republicans, incredible pressure was put on the banking systems particularly Visa to conform. The action that the banks were ordered to take over the next 36 months was to stop allowing transactions coded as gaming from being processed through any US based banks. There are as many opinions as there are those holding them concerning the real reasons behind the “so called” gambling ban. We are calling it so called because with the exception of a few states like Utah, there actually isn’t a gambling ban per se. What the port bill addendum did was to crack down on the banking system that underpins online gaming finance. When I first heard about this port bill, like many others I was baffled. “Port Bill? What was or what is that?”, many thousands of us asked. Well, it is exactly what it sounds like. Its drafted legistlation regarding security of America’s ports ( think ships and entry points ). So, back to the point, what does a Port Bill have to do with gaming law? The truth is nothing but once this addendum regarding gaming was tacked on and pushed quickly through a senate that was unprepared, it was law irrespective of whether the proper channels were used. So, here we are 3 almost 4 years later and what other than the overt stoppage of credit card usage has been accomplished? -And my favorite – Vegas has had 3 more glorious years to figure out how to jump on the online gaming bandwagon. Ok, so all of that is old. Let’s look at what’s new. Calvin Eyre admits on a nationally televised and syndicated TV show that he has sold his [Billion Dollar] gaming interests to the Kawanakee group at the Mohawk Indian reserve just outside of Montreal. British Columbia admitted it couldn’t stop the hundreds of millions of dollars going overseas and in a rare show of unity simply approved online gaming – once its done at their own online facility ( No, we are not going to tell you the name, lol ). Thus becoming the first province/state in North America to legalize gambling. Provincial Premier, Dalton McGinty admits, “… in a perfect world Ontario would have not had to rely on gambling revenue at all, but he acknowledges the government needs the cash. In the meantime, on the US front, on August 10th it was reported that Representative Barney Frank is now closer to bringing his online gambling legislation before the entire House, after picking up his seventieth co-sponsor for the bill. Rep. John Campbell who signed on at the end of July. The past couple of weeks have been good for online gamblers in the US. First, Rep. Frank held a hearing on H.R. 2267, the Internet Gambling Regulation, Consumer Protection, and Enforcement Act in which representatives both for and against the legislation spoke. The biggest concern however is that with both republican and democratic support required and it being so close to elections, many necessary representatives who might ordinarily support the bill may be squeamish of putting their name to something that could be used against them in upcoming months. If the bill eventually passes the House, it will still need the support of the Senate before the Unlawful Internet Gambling Enforcement Act is officially overturned. What Bush’s team sneakily attached to that Port Security Bill nearly 4 years ago is going to take the support of the full Senate to overturn. However, Canadian Provinces breaking their historical lockstep movement with US law in a bid for closing doors on the hundreds of millions flowing outward is going to put even more fiscal pressure on the US Legislators to do something to stem the leak of billions in tax revenue.